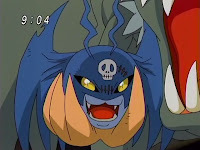 Digimon: System Restore: Data Squad Episode 11: The Vile of Vilemon! Last one! There's light at the end of the tunnel! Thomas has picked up on the pattern of Digimon trying to fulfill human desires and sets off for America to research this phenomenon. Apparently only America has a supply of human guinea pigs. In the meantime, Marcus and Yoshi are left to deal with one more case, one that threatens... absolutely nobody. The saving grace of the last three episodes were that each of the main characters had an emotional connection to one of the involved parties. Yoshi had some sort of bond with Neon, Thomas idolized Harris, and Marcus is related to Kristy. The effort to establish a similar bond this time is embarrassing. 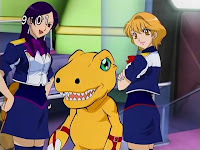 When Agumon eats a box of buns that Miki and Megumi brought to share, Marcus takes responsibility and promises to buy them buns of equal quality. His target bakery is shut down because the best way to solve your financial problems is closing your successful, popular business. Yeah, Marcus is determined to get this bakery opened again because he's afraid of returning to Miki empty-handed. Much as I want to give Marcus credit for making good on his partner's crime, this is just silly, and the whole episode hinges around Marcus being determined to get this damn manju. As in it's entirely possible that this case doesn't get closed if Marcus wasn't dead set on making up for Agumon's gluttony. The radars are so ineffectual that any of Vilemon's activities would go down as mere blips on the radar. It didn't even detect the trio of Demidevimon directly interfering with a horse race. Only Lalamon sensed them, and only because Marcus dragged her and Yoshi to the track. Really, other than the internal family strife and a rough day for the bookies, who's being harmed by Vilemon's antics? Shitori's excessive greed is inexcusable, but there's no denying that his gambling success got the family out of a real jam. He closed the bakery to care for his sick wife, and borrowed money from some mobsters to pay for her health care. Thanks to Vilemon, she's able to get the treatment she needs and he gets to keep his thumbs. The bakery is only reopened due to Vilemon's interference, yet everybody seems to overlook this fact. Given the big show Harris made about forfeiting his title bout as he earned the opportunity unfairly, that's a bit hypocritical. What separates this encounter from the others is that it's the first time the Digimon is clearly running the show. Every other time, the humans are either selfish or take an innocent request (or insincere in Kristy's case) too far. This time, Shitori is only praying for money to keep his family together, but Vilemon possesses him to take it to the extreme. 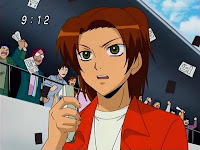 Under his own control, Shitori easily would have cashed out after the first trifecta and gone back to making his Guilmon bread. 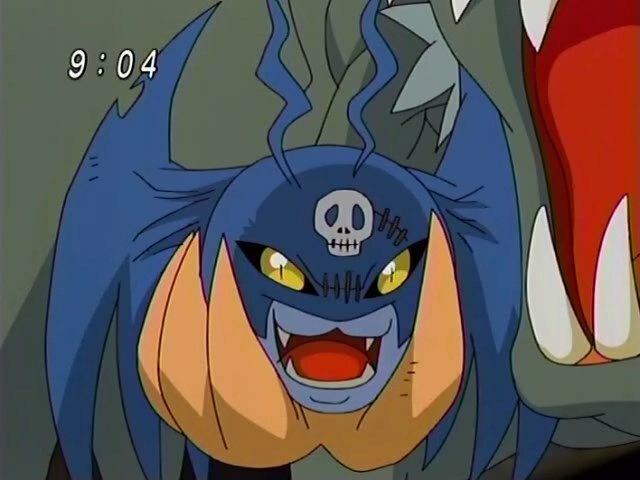 It adds up to a significant development in the human-Digimon emotional connection that Thomas is away researching. His research is supposed to be part of the plot advancement we've been waiting for, but all we get this episode is a couple scattered shots of him talking to old professors and some unethical human research. He returns frantically demanding that security be heightened, but his actual findings have to wait until next time. Hmm... maybe the fact that security was apparently low might explain why the system wouldn't bother to notice three monsters shooting a bunch of syringes into horses. Thomas has to request time off to research his theories on Digimon. Wouldn't that qualify as being job related? Agumon asks if America is edible. If it is, it's probably even more unhealthy than all that manju he ate. The occasional hostility Miki and Megumi show towards Yoshi is delightful. You get the sense that they're jealous that she's considered a main character, or at least that she gets to leave HQ from time to time. This episode is too lousy to praise it for being mature, but it does feature the mafia, horse betting and a gambling addiction. Not bad, but it still felt like it should have ended with a cute short where Lalamon explains betting odds to children.